"We have succeeded in building a thriving country, a world leader in economics, technology, security, cyber, and health." 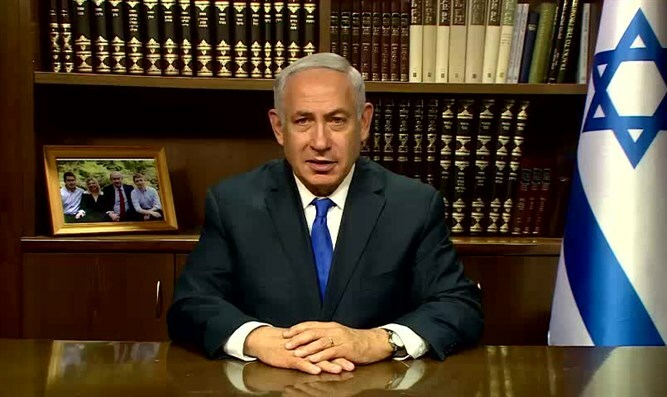 Prime Minister Binyamin Netanyahu addressed the National Union's political conference on Tuesday, in a video message that will be played at the confab held at Jerusalem's International Convention Center. Netanyahu began his remarks by celebrating Israel's success. "Not so many years ago, this land was desolate and abandoned, but since our return to Zion, after generations of exile, the Land of Israel is flourishing," he said. "In less than 70 years, we have succeeded in building a thriving country, a world leader in economics, technology, security, agriculture, cyber, health and many more," he continued. "We are building the land everywhere we can. In the Galilee, in the Negev, as well as in Judea and Samaria, because this is our land, the home of the Jewish people, the land that was promised to our forefathers. Keep it safe "
Netanyahu concluded by invoking last week's Torah portion. "Bless your people Israel, and the ground which you have given us, a land flowing with milk and honey, as you swore to our fathers" he quoted. The National Union is a faction in the Jewish Home party. Founded in 2001 as a joint list for a number of small right-wing parties, it is today headed by Agriculture Minister Uri Ariel. The faction will be holding their first-ever diplomatic affairs conference Tuesday, in which they will debate on MK Bezalel Smotrich's 'One Hope' plan, which calls for subsidizes to encourage Palestinian Arabs to emigrate from Israel.